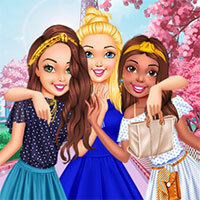 Besties In Paris is decor game and fashion game. Barbie and two close friends are going to travel to Paris. Please choose the stylish, charming clothes for them. Then, take a commemorative photo and choose the envelope for that photo. Game Besties In Paris played 13 times.